In order to ease digital money transfer and help e-commerce companies to reach smaller cities and towns, electronic payment companies like Paytm, Mobikwik, Itzcash and Oxigen are all set to explore the newly-introduced niche banking space. 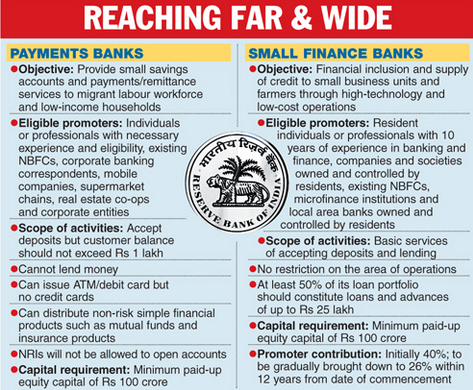 Looking at the need of niche banking space in India, a country that still has 41% of its population unbanked, payments banks are likely to provide the unbanked population of India with access to electronic transactions. This initiative will also open up an opportunity for electronic payment companies to expand significantly. “The opportunity is significant but at the same time there are regulatory considerations that we will have to match up,” said Satyen V Kothari, managing director and founder of Citrus Payment Solutions. “Given the nature of the Reserve Bank of India and how the government works in India, the regulatory compliance part needs to be considered,” he added. As per the report by ‘The Times of India’, RBI has even published guidelines for payments bank licenses recently and that the application for it has to be submitted latest by January 16, 2015. As hinted by the regulator, licenses are likely to be issued early next fiscal. This will certainly open up a great opportunity for e-commerce firms to grow their customer base by increasing the number of cardholders in the smaller towns. The cardholders availing this service will be able to transact online with ease and access the sites. The initiative could actually be called a win-win situation for both businesses and consumers. “RBI norms are encouraging. We are optimistic that with a platform like Snapdeal, goals of Snapdeal, goals of Digital India and financial inclusion will be possible,” said Aakash Moondhra, Snapdeal’s VP, finance. This opportunity according to the wallet companies is going to win customers’ trust for them, on the other hand, which can make this mode to become an alternative to mainstream banking. “The consumers who are using wallets for the first time are becoming tech savvy,” said Vijay Shekhar Sharma, CEO and founder of Paytm.